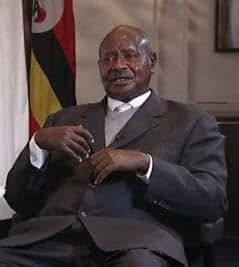 Ugandan President Yoweri Museveni has said that receiving foreign aid in exchange for the fair treatment of his country’s LGBT community is “sinful," according to The Telegraph. Several countries have cut aid to Uganda in response to the introduction of severe anti-gay laws that include a sentence of life imprisonment. Last month the U.S. cut aid to Uganda, imposed visa restrictions on Ugandans involved in human rights violations, and cancelled a planned military exercise with the Ugandan army. Speaking at a religious conference in Kampala, Museveni welcomed cuts to foreign aid because they had "aroused" Ugandans and made them realise they needed to "undertake serious work" to build self-reliance. "In his speech [Museveni] made clear that Uganda can be self-reliant, and the aid cuts have woken us up and invigorated us. The president has always opposed aid, from the beginning."